Grains seeing some mixed trade near the break. Wheat up 4 cents, corn up 1 ½ cents, and beans down 3 ½ cents. Weekly U.S. soybean export sales are est near 400-700 mt, corn 5000-800 mt and wheat 200-500 mt. For the month, winter wheat prices were down roughly 18 for HRW, corn was up 7 cents, and soybeans down 7 cents. U.S. soybean crushings in September likely totaled 5.131 million short tons, or 171.0 million bushels; estimates ranged from 170.2 million to 171.6 million bushels; it would be up from a 169.6-million-bushel crush in August; above the September 2017 crush of 145.4 million bushels. USDA WASDE report out Nov 8th. Total weekly DOE fuel ethanol production rebounded for the second straight week, up 35,000 barrels per day on the week ending last Friday (10/26), to 1.059 mln bpd; that was basically a wash with last year’s 1.056 mln bpd, with last year’s output going on to make a record peak at 1.108 mln bpd on the week ending 12/1/17. 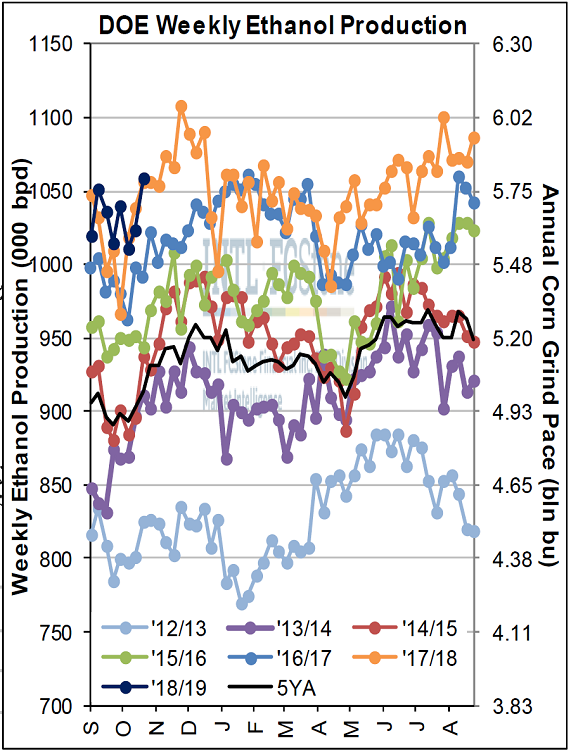 Cumulative production through eight weeks rose to 1.032 mln bpd, up 11k bpd from last year’s pace—pretty close to the pace needed to hit the USDA’s +49 mbu YoY corn use for ethanol estimate.